I LOVE reading with each of my kiddos separately! 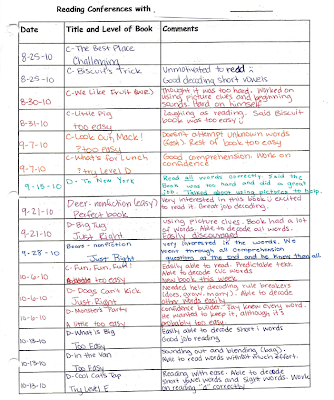 I try to schedule as much time as possible to read with each one. I am a strong believer that individual conferences help children more than small groups. In just 5-7 minutes I can encourage, motivate, praise, and address their SPECIFIC reading issues. My kids are always so excited when it's their turn to read to me. They are also disappointed when assessment time rolls around and I can't get to each one as quickly. Typically I spend 30 minutes each day reading with children by themselves. I try my hardest to read with a new child every 5 minutes. By the end of the week I have read with each child at least once. They will also come to see me for a small group (once a week), and another time daily if they are in my intervention group. I created a little form to use to keep up with all these conferences. I like it because all the conferences are in one spot. 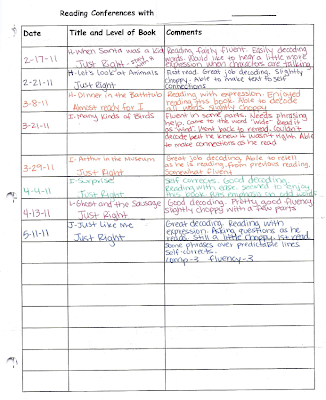 It shows their reading progress (or lack thereof) and it's great for parent conferences or referrals. Plus, I can quickly scan my notes from the previous week to remember what was discussed last week. 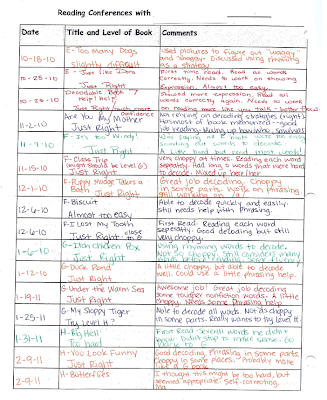 I like to use a different color pen each week, so I can quickly see which students I have read with for the given week. 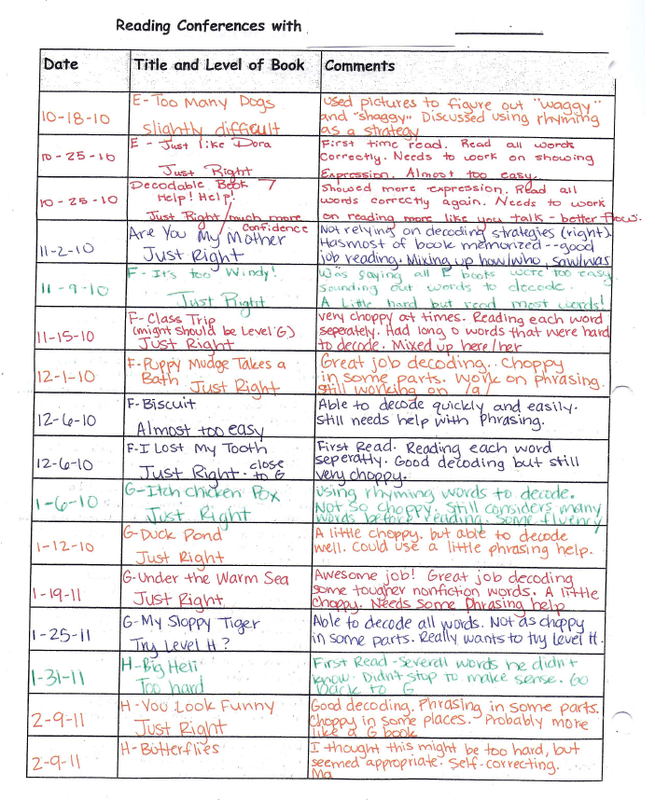 I know when each child has notes written in "orange" that I've covered everyone. 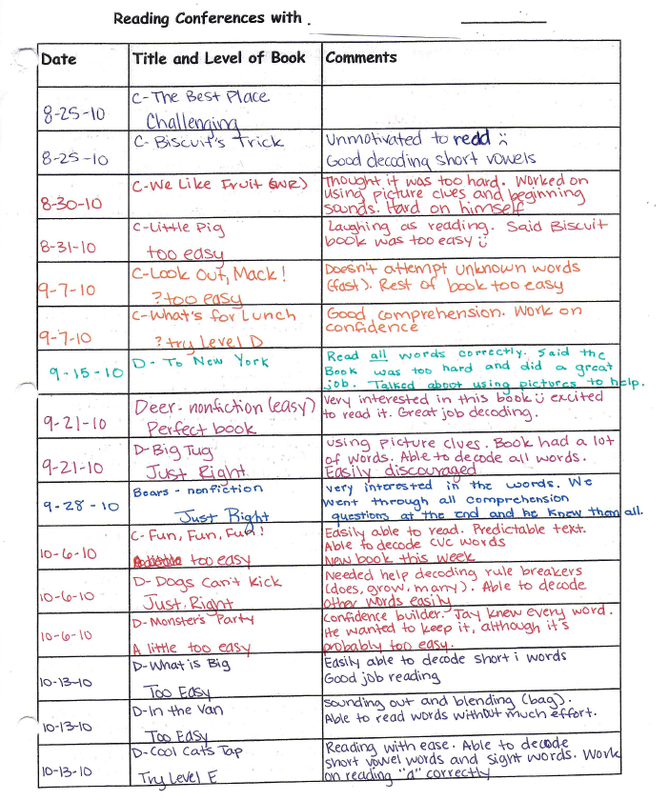 Below is an example of my reading conferences with a child in my class last year. This little boy came to first grade a little behind and unmotivated to read. He had very little confidence and cried every time he missed a word. My main goal at the beginning of the year was to build confidence and promote an interest in reading. By the end of the year he was a good little reader and ready for second grade. If you look carefully at the dates I recorded his conferences, you'll see that some weeks were missed. 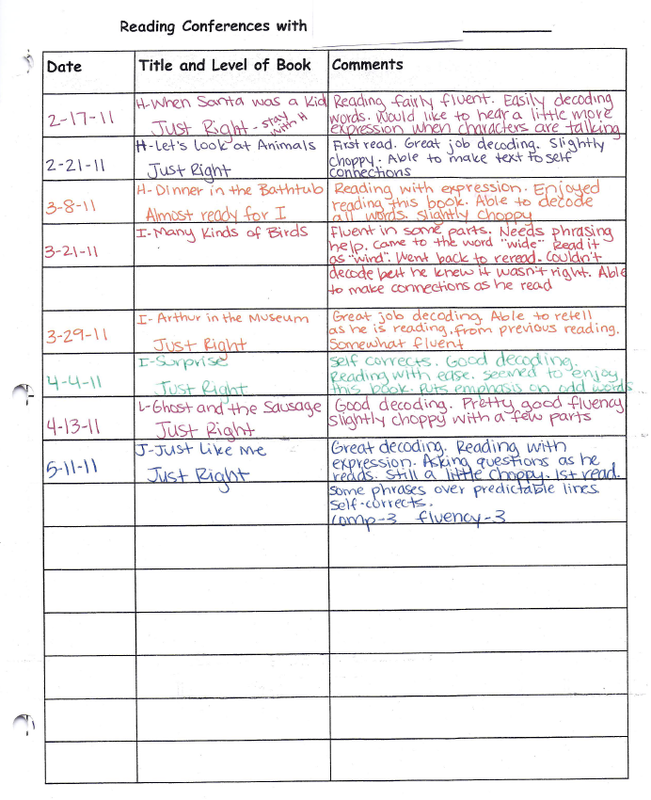 Those mainly fell around end-of-quarter grading periods or short weeks in school. Hey, I'm a REAL teacher and as much as I try to read with each sweet pea every week, sometimes it just doesn't happen.